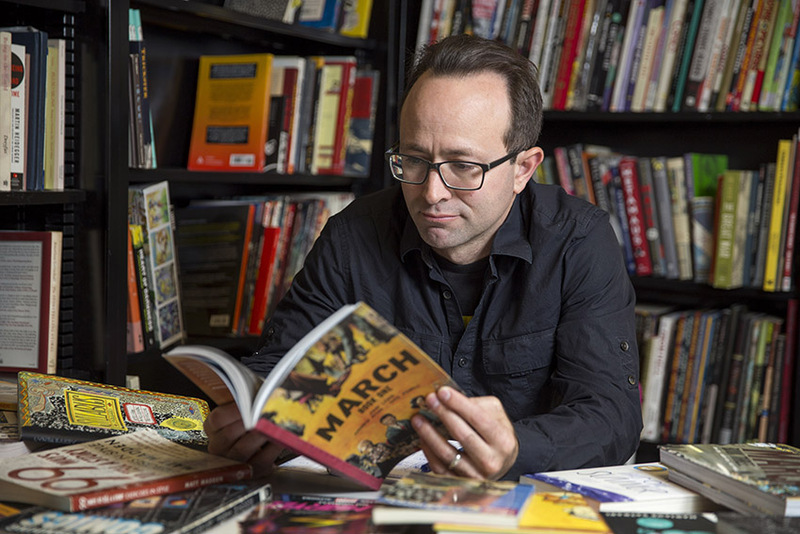 SF State Professor of Humanities and Liberal Studies Nick Sousanis reads a graphic novel in his classroom. The two courses are part of a forthcoming 12-unit minor that’s set to launch within the next year with classes also offered in the History and English departments. When it officially launches, SF State will be one of only handful of other programs in the United States (not including art schools) with a similar program. In the “Comics and Culture” course, students will study the evolution of the comics form and how its being used in different disciplines. They’ll also look at theory and form, explore how ideas are communicated visually and try their hands at making comics. In the “Making Comics” course, most of the class will be devoted to creating comics. Sousanis, an assistant professor of humanities and liberal studies, is quick to say that the class doesn’t require any artistic ability. He’s more interested in how drawings can help organize a person’s thinking. An award-winning graphic novelist, Sousanis said his love for the form began basically at birth. His older brother would read him comic books. When he started talking, his first word was “Batman.” At 13 he published a comic series about a superhero called “Lockerman.” And he’s made comics consistently ever since. Academically, Sousanis doesn’t fit neatly into any one category — he’s at once an artist, a storyteller, a mathematician, a philosopher and an educator. As a professor he’s able to speak to students in a variety of disciplines because he’s interested in how people think about these topics and communicate these ideas through images. Similarly, graphic novels cross into a variety of disciplines: philosophy, history, science, journalism and literature. So, as one might expect, the road to teaching comics is one that may defy expectation. Comics and graphic novels are currently enjoying a renaissance. Not a season goes by that doesn’t have at least one movie based on a comic book in theaters. But when Sousanis was an undergraduate at Western Michigan University, they weren’t part of the dominant culture and they definitely weren’t part of academia. “Comics weren’t really subjects of study in 1993. If you wanted to do intellectual things, which I did, that wasn’t what you did,” he said. What he did do was study mathematics. “I enjoyed the thinking of it,” he explained. He finds a similarity between that type of thinking and the way he thinks about his art. When he pursued his doctorate in education at Columbia University he combined intellectual inquiry and teaching and fused them with comics. The end result was “Unflattening,” a critically acclaimed and award-winning doctoral dissertation in comic form that was later published by Harvard University Press. The book weaves together diverse ways of viewing science, philosophy, art and literature, using narrative illustrations to show that perception is an active process. “Unflattening” is the first ever comic to be nominated for the American Publishers Association PROSE Award for Excellence in Humanities. “My work was hailed as sort of this revolutionary thing in academia. But to me, this was just an extension of what comic books could be,” he said. “I think there’s long been a dissatisfaction with research that has to be 12 pt. type, double-spaced. That dissatisfaction has been there a long time. I didn’t come in trying to push against it. I just came in saying this is what I’m doing.” Since then, Sounsanis has been an outspoken champion of comics and alternative scholarship. Sousanis embraces graphic storytelling as a tool for education because of how it can make complex ideas more accessible and broaden conversations. “I thought I could reach people that needed to be reached. The only reason they couldn’t understand something was because of vocabulary, not because they weren’t smart enough. Comics are a way to bridge those worlds,” he said. Cristina L. Ruotolo, chair of the School of Humanities and Liberal Studies, hopes students in these classes walk away with an understanding of how diverse the canon of graphic narrative and comics has been and is becoming. “What he’s doing is really important because it’s a form that’s evolving and entering into new arenas,” she said. Sousanis said he hopes that after taking his classes, students understand themselves better as visual communicators, thinkers and makers and that they see how comics allow them to say things that can’t easily be said in other media. Click here to learn more about Sousanis and his work.